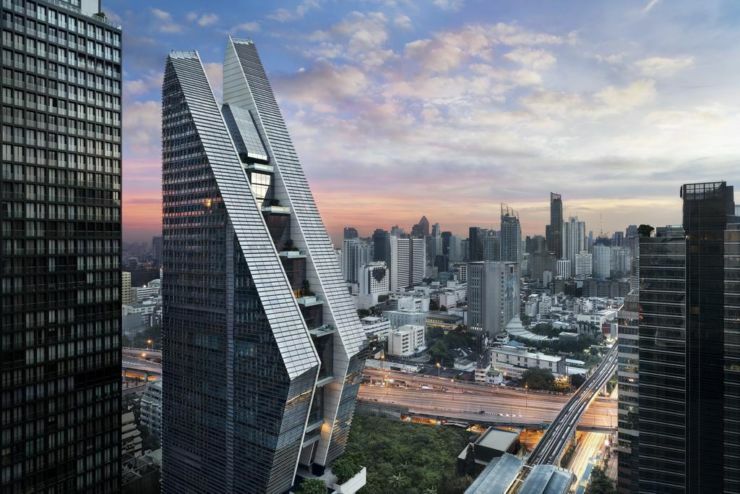 In addition to the structure’s glossy façade and stunning architecture, water features within the hotel — including a dramatic, indoor 10-story waterfall — are a tribute to Bangkok, a city built on water. The element of water — sacred in Thai culture, featuring in rites and rituals to symbolize peace and harmony — is a pervasive theme throughout the hotel. The hotel also showcases works of established and emerging Thai artists including significant pieces by Preecha Thaothong, named Thailand’s National Artist of the Year 2009; Pinaree Sanpitak, one of the coutnry’s most respected female artists of her generation; and Torlarp Larpjaroensook, whose work both challenges and intrigues. The hotel’s “Art Connection” quarterly rotating exhibit features the multi-media works of emerging Thai artists, launching with a showcase of oil paintings by Kittaya Poolsawatdi. Nan Bei, meaning South and North respectively in Mandarin, is Rosewood Bangkok’s landmark restaurant — a buzzy, stylish destination for Chinese dining, offering authentic regional specialties from the two China regions, served both indoors and outdoors. Open kitchens are dedicated to preparation of popular Southern Chinese seafood dishes and world-famous Peking Duck. Nan Bei represents Rosewood’s signature flair of establishing contemporary and differentiated dining concepts, with Nan Bei sure to become the “go to” hotspot amidst Bangkok’s dynamic restaurant scene. Introductory offers, including selections of hotel signature experiences, are available to 30 June 2019. “Redefining Bangkok” rates start from THB9,450 and “Signature Suites Stay” from THB17,550 per night, excluding tax and service charge, based on single or double occupancy and subject to availability.